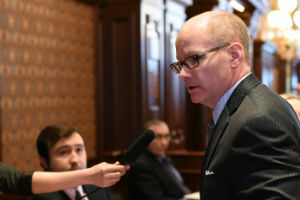 SPRINGFIELD – State Senator Don Harmon (D-Oak Park) passed a measure out of committee today that would create safe zones from immigration enforcement in Illinois. The legislation prohibits state and local law enforcement from carrying out federal immigration efforts at locations including state-funded schools, state-funded medical treatment and health care facilities, public libraries, facilities operated by the Secretary of State, and state courts. According to a 2014 study by the Illinois Coalition for Immigrant and Refugee Rights, roughly 68 percent of undocumented immigrants participate in the labor force in Illinois, a higher rate than that of the general public (66 percent). 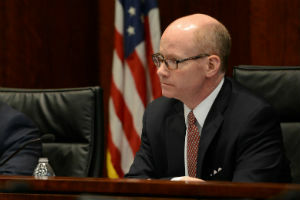 Harmon’s measure also prohibit applications for state benefits from asking for information related to citizenship or immigration status unless otherwise required by law. Senate Bill 35 passed the Senate Judiciary Committee 8-4 today and moves to the full Senate for consideration. “The governor must be much more concerned about his immediate political prospects than we thought, because he decided to be a lap dog for the NRA today rather than listen to the people he represents. “Eighty-five percent of Illinoisans support licensing gun dealers. Governor Rauner has decided to be the governor of the nine percent who don’t. “Tomorrow, students across the country will stand up and beg elected officials to do their job and protect schools from gun violence. By issuing this veto on the eve of those demonstrations, the governor is telling them that he has no intention to live up to that responsibility." The Gun Dealer Licensing Act passed the Senate last April and passed the House in February with bipartisan support. 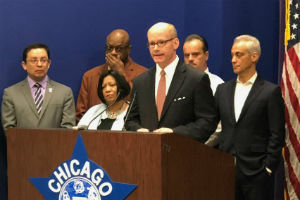 CHICAGO –State Senator Don Harmon (D-Oak Park) today joined Mayor Rahm Emanuel, Chicago Police Department Superintendent Eddie Johnson, fellow legislators, gun violence prevention advocates and victims of gun violence in calling on Gov. Bruce Rauner to sign the Gun Dealer Licensing Act. The measure would allow Illinois to license gun dealers, holding corrupt dealers accountable and cracking down on straw purchases. According to a 2014 report from the University of Chicago Crime Lab, almost 20 percent of all guns recovered from crimes scenes in Chicago from 2009-2013 came from three of the state’s 2,400 dealers. 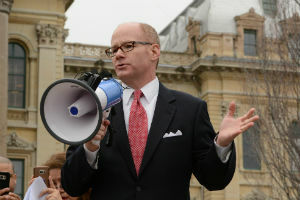 At a press conference this morning, Harmon said the measure is not only good policy, but also has broad public support. Senate Bill 1657 passed the Senate last April and the House last month with bipartisan support. Rauner has yet to indicate whether he intends to sign it into law. State Senator Kwame Raoul (D-Chicago), who cosponsored the measure, joined Harmon at today’s press conference and shared the impact gun violence has had on his life. 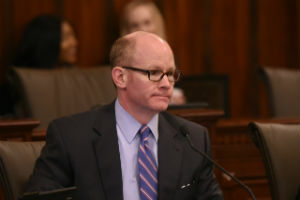 CPD Superintendent Johnson called the measure “commonsense legislation” and said he was proud to lend his voice to the group calling on the governor to sign it into law. Emanuel suggested that Rauner, with his reluctance to make a commitment on the legislation, is putting politics ahead of the people of Illinois. Senate Bill 1657 was delivered to the governor’s desk on March 1. If he does not sign or veto it in 60 days, it automatically becomes law.